Inspired by a photograph of a mother flamingo feeding her baby. Permission granted Daniel Zupac. Wholecloth. Ice-dyed Radiance silk cotton mix. Hand-guided free motion quilting on a longarm machine. 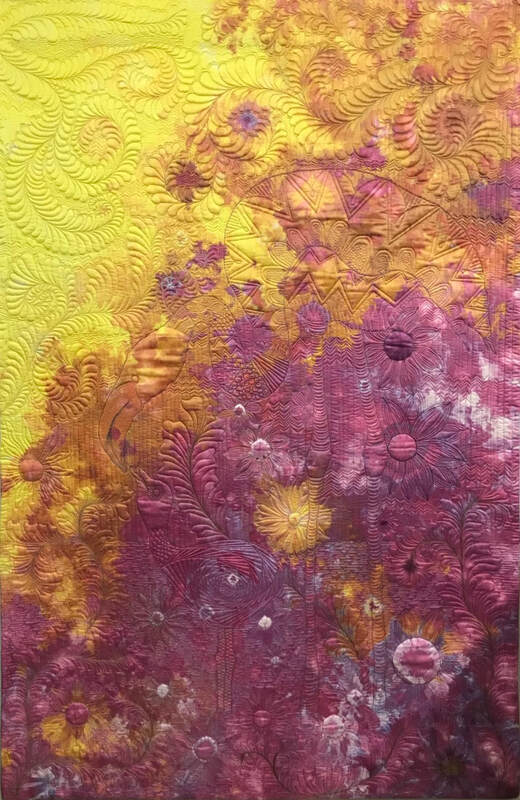 ​An abundance of interesting circles were created during ice-dyeing of this piece of Radiance using some Shibori-style techniques. The colours and shapes created in the fabric are my design guide and the circles became my starting point when stitching. Imagination focused on the possible creatures hidden within the fabric landscape and the design emerged layer by layer.